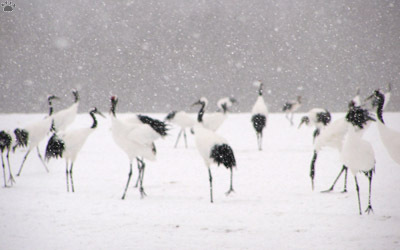 Red-crowned cranes (Grus japonensis), Kushiro-Shitsugen National Park, Hokkaido. Writing about visiting Japan as "adventure travel" seems a bit strange: it is the safest and best-organized country in the world. Flying there from the USA feels a bit like going to Europe from the Soviet Union. But to fully enjoy your visit to this fascinating land, you have to learn a lot, and be really good at logistics and planning. 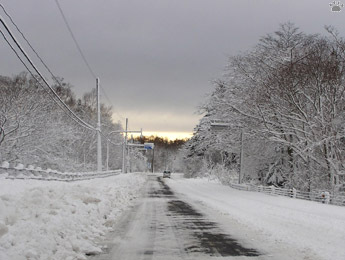 Winter road, east from Kushiro, Hokkaido. Dwarf bamboo (Susa sp.) under snow, Shiretoko National Park, Hokkaido. 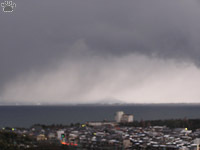 Winter storm over Lake Biwa, Honshu. 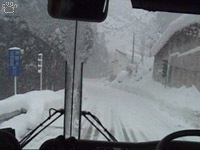 Winter is a difficult time to explore Japan: bad weather, short days and slippery roads. But it's the only time to see some natural wonders; besides, parks and temples are less crowded. 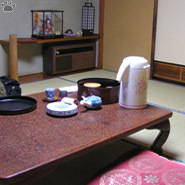 Ideally, to see all that Japan has to offer, you have to visit it in all four seasons, or, better, live there for a year to see all museums (some are only open on certain dates) and carnivals. Bus ride to Togakushi, Honshu. 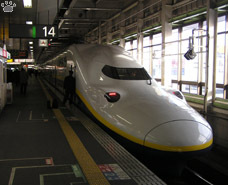 Shinkansen (bullet train) network is the world's safest and most efficient transportation system. In almost 40 years of operation, it didn't have a single fatal accident. 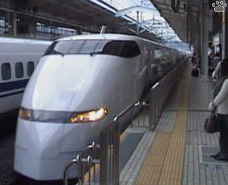 And, as all things fast and efficient, these trains are very beautiful. 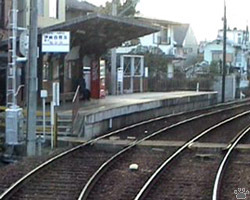 Small countryside railway station, near Kyoto, Honshu. The best part of being there is the schizophrenic everyday routine of local life, combining runaway modernization with medieval conservatism. 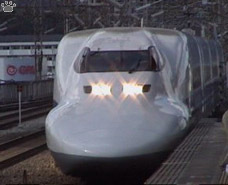 You can be flying through space at 300 kph in a bullet train; and an hour later crawl across the hills in a tiny one-car train where you have to pay the fee to the driver himself. 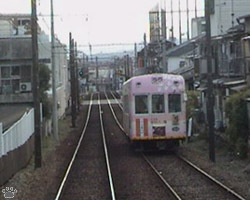 Local one-car train, near Kyoto, Honshu. 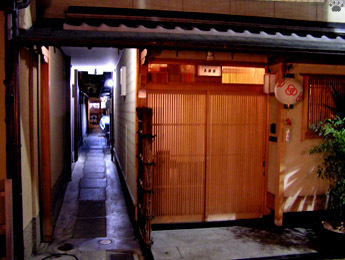 Inn entrance, Kyoto, Honshu. 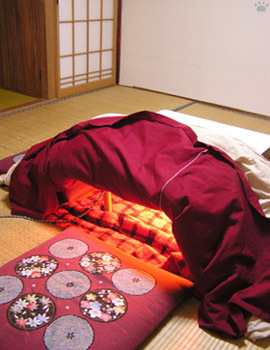 One day you sleep in a modern capsule hotel with 18 buttons on the toilet seat operation console. 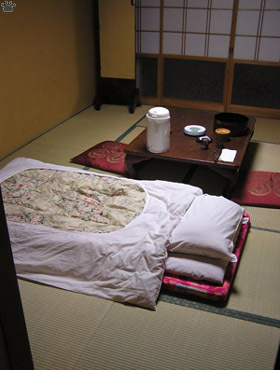 Next day you stay in a village ryokan or minshuku (inn), where nothing has changed in 300 years since it was built. 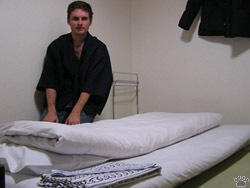 By the way, living in those inns requires some knowledge of the etiquette - be sure to read all about it in advance. 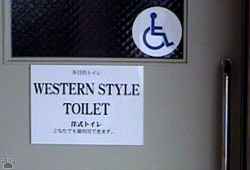 Most guidebooks discuss it in detail. 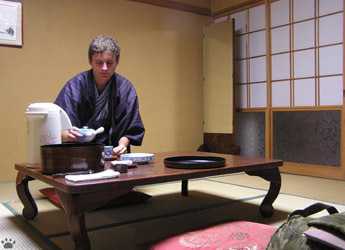 Performing tea ceremony, Yudanaka, Honshu. 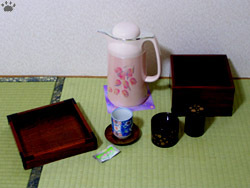 Heated table, Yudanaka, Honshu. 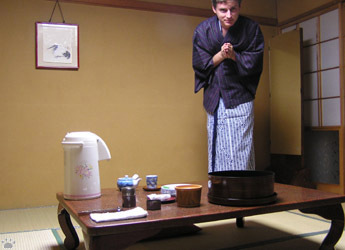 In cold areas, inns have heated tables (to put your legs under) and onsens (indoor or outdoor baths on hot springs) where you can sit and watch the snow fall on forests and mountains. Finding inns and hotels is easy. 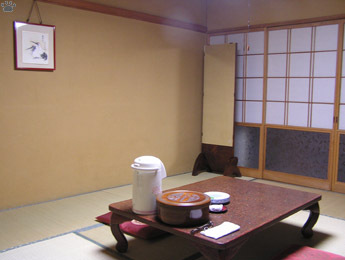 Ryokan sign is written with 2 characters, the 1st with 4 short legs like a table, the 2nd with 4 windows like a house. Hotel is written with 3 letters, the 2nd like"T", the 3rd a bit like "L". 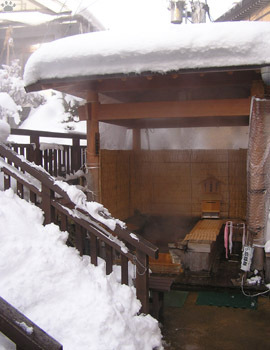 Public bath on a hot spring, Yudanaka, Honshu. 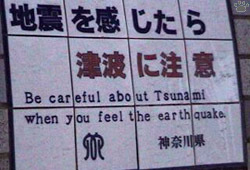 Very few signs in Japan have English translations, although highway junctions usually are signed in English. If not, you can navigate by road numbers (if you drive or hitchhike), but it's always better to learn the characters making up the name of the place you are going to. Graphic road signs are mostly self-explanatory. 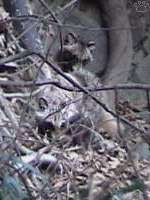 The one above (on the left) refers to tanuki, or raccoon dog (Nyctereutes procyonoides). This Asian animal is variously called "badger" or "raccoon" by non-biologist translators of Japanese literature. 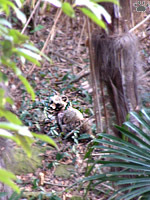 (True badgers do occur in Japan, but raccoons don't). 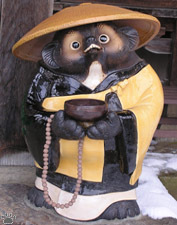 Tanuki is immensely popular in Japanese folklore. 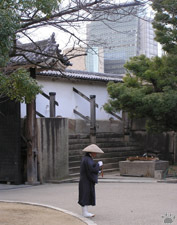 The wooden statue above is dressed like a Buddhist monk collecting money for his temple. Unlike tanuki, kitsune, or red fox (Vulpes vulpes) was feared in the old days. It was believed that foxes could take human form and could put spells on people. 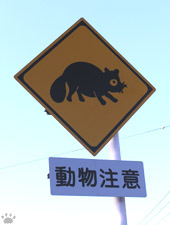 Both tanuki and kitsune are very common in Japanese countryside. 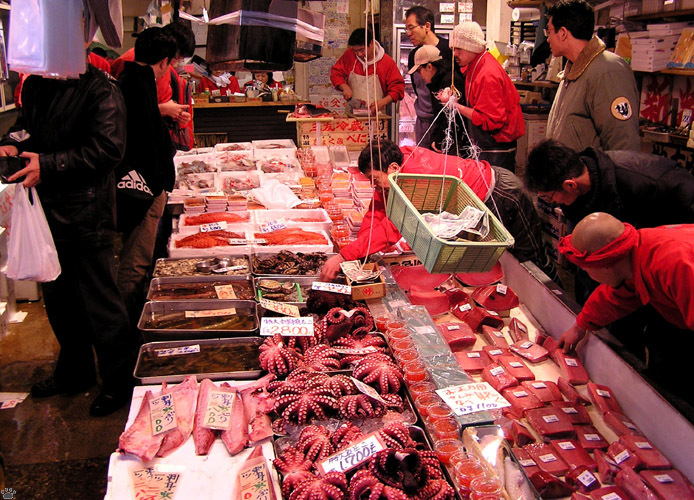 Tsukiji Fish Market, Tokyo, Honshu. Five new fish species have been described from specimens obtained here. At the time the photo was taken, the exchange rate was approximately 110 yen for 1 US$. 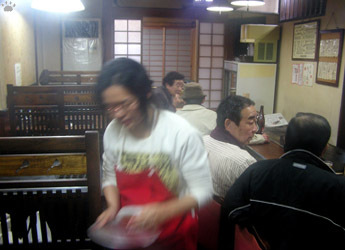 cheapest and fastest way to sample the local cuisine. 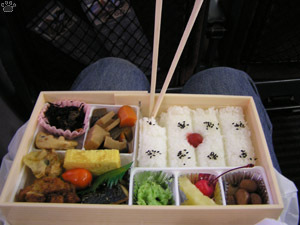 Food is another highlight of a trip to Japan. It isn't cheap, but the diversity of it (and of the types of places where it's served) is amazing. 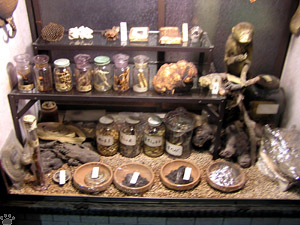 armadillo skin in the upper left. 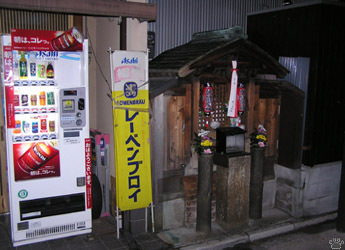 A vending machine and a roadside Shinto shrine, Kyoto, Honshu. Sunset over Mt. Fuji, Kamakura, Honshu. Once you've figured out the practicalities of finding food, shelter, and transport, you can move on to exploring all the cultural and natural wonders of the country. And there's a lot to explore. 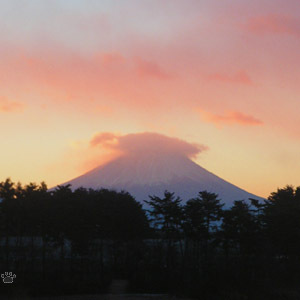 Sunrise over Mt. 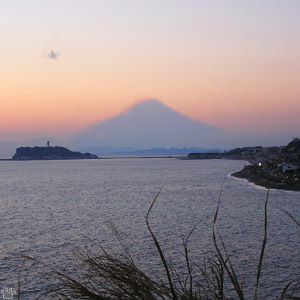 Fuji, Hakayama, Honshu. 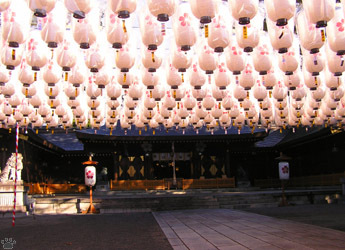 Paper lanterns at a Shinto shrine, Himeji, Honshu. 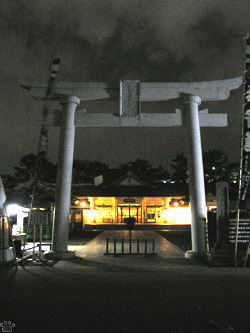 Modern Shinto shrine, Hiroshima, Honshu. Torii at a Shinto shrine entrance, Hiroshima, Honshu. 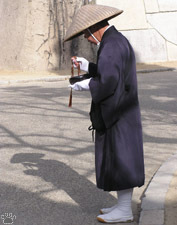 Japan has two main religions: Shinto and Buddhism. 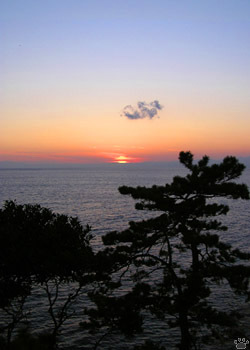 Shinto is uniquely Japanese, although a bit similar to ancient animistic religions of Korea and China. Buddhism and associated culture were imported from China, but later evolved into local varieties, most notably Zen. 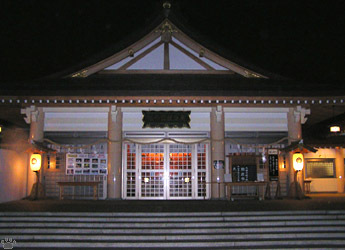 Over time, Shinto shrines became similar to Buddhist temples. 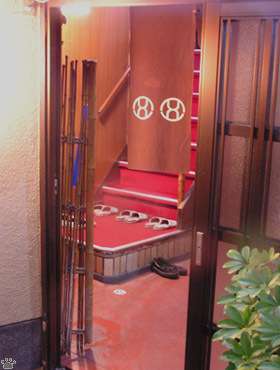 You can distinguish them by their entrance gates: shrines have torii (frame-like gates made of wood or steel), while temple gates look more like small buildings. 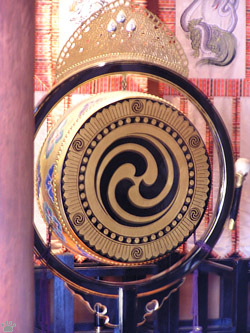 Drum, Shinto shrine at Himeji, Honshu. 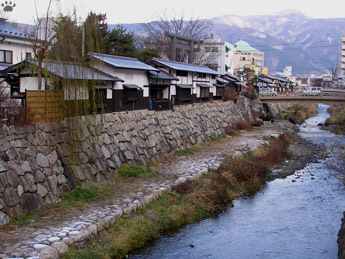 Small river flowing through the city of Matsumoto, Honshu. Miniaturization rules in Japan: even snowmen are tiny. Nikko, Honshu. 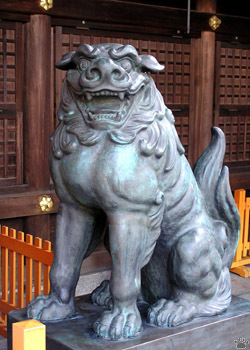 Guard dog in a Shinto shrine, Himeji, Japan. 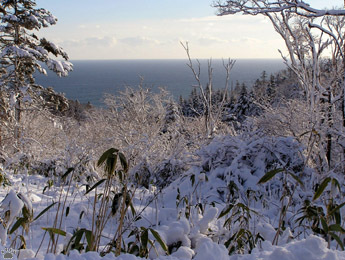 In December 2005, I spent two very intense weeks on Japanese islands of Hokkaido, Honshu and Kyushu. Most museums and some other interesting places were closed; obviously, parks and gardens were not at their best. Still, it was a fascinating trip. Japan is a very expensive country, but I managed to spend just over a thousand dollars and see a lot of wonderful things, some of them "winter-only". I can't wait to go there again - in April, June and October, to visit smaller islands and more remote mountain areas. 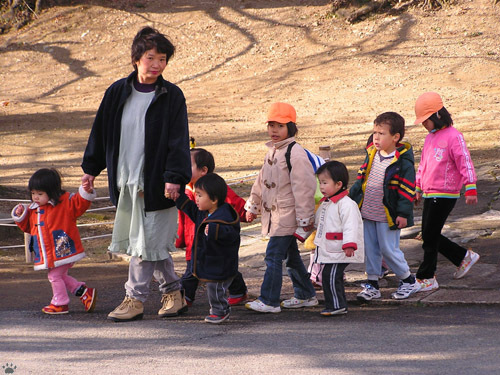 Small private kindergarten on a walk, Himeji, Honshu.